Lucasfilm has released 16 new photos from the first Star Wars standalone movie, Rogue One: A Star Wars Story. The photos include new shots of Felicity Jones as the lead character, outlaw Jyn Erso, Ben Mendelsohn as the villainous Director Orson Krennic, Donnie Yen as the blind monk Chirrut Imwe who worships the Force even if he can't use it himself, Jiang Wen as the skeptical Baze Malbus, and K-2SO, the droid played by Alan Tudyk. 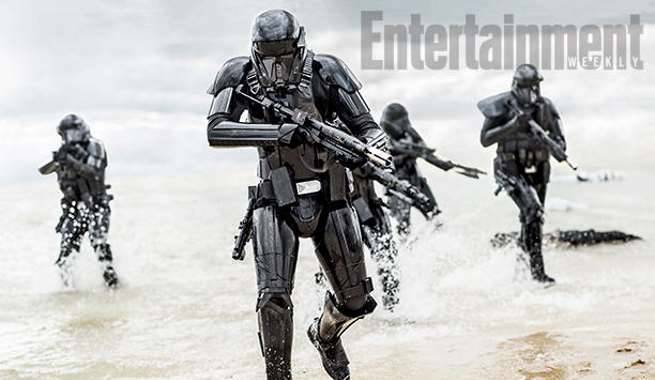 There are also photos of the intimidating Deathtroopers that will be tasked with hunting Erso’s team down, and the still unnamed tropical planet located near the Death Star where a significant portion of the film will take place. Rogue One: A Star Wars Story is set between the events of Star Wars Episode III: Revenge of the Sith and shortly before the events of Star Wars Episode IV: A New Hope. In the film, resistance fighters embark on a daring mission to steal the Empire's plans for the Death Star. Rogue One: A Star Wars Story stars Felicity Jones, Diego Luna, Riz Ahmed, Ben Mendelsohn, Donnie Yen, Jiang Wen, Forest Whitaker, Mads Mikkelsen, Alan Tudyk and Jonathan Aris. The film is directed by Gareth Edwards and written by Gary Whitta and Chris Weitz, from a story conceived by John Knoll. Principal photography took place at Elstree Studios in Hertfordshire beginning in August 2015, with some scenes shot in Maldives, Iceland, and Jordan. Scheduled reshoots began in June 2016. Check out when Rogue One: A Star Wars Story and other movies are coming out in ComicBook.com's Movie Release Schedule.